VietNamNet Bridge - A 200-year-old sua (Dalbergia tonkinensis Prain) offered for sale at VND50 billion (nearly $2.5 million) was felled and transferred to the buyer in late March. The buyer was Nguyen Van Huy from Dong Ky village of Tu Son district in Bac NInh province, who offered the highest price of VND24.5 billion at an auction held in August 2016. 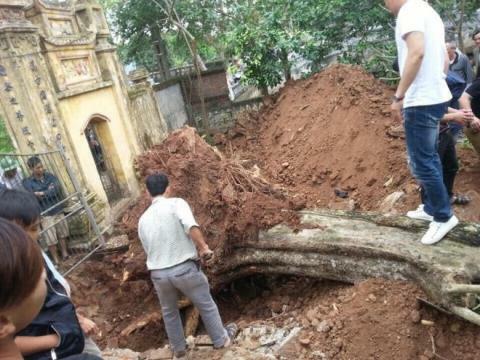 Nguyen Van Hien, chair of Ha Man commune in Bac Ninh province, confirmed that the tree was delivered to Huy on March 25. Huy accepted to pay VND1.5 billion more to ‘support’ the local authorities, raising the total value of the sua tree to VND26 billion (over $1 million). Huy, the buyer, said the wood will be sawn at his family’s wooden furniture workshop to make valuable furniture products. The commune’s leaders said at the time the tree was felled, a part of the roots and branches had rotted. A 200-year-old sua (Dalbergia tonkinensis Prain) offered for sale at VND50 billion was felled and transferred to the buyer in late March. However, the public said the tree was sold too cheaply, compared with the price of VND49 billion that one person had paid before. This was also the cause of the clash at a meeting between local authorities and locals on December 7, 2016, where a young man was beaten. Huy said he fears he may take a loss with the deal because he only felled the tree months after he offered the price at the auction. However, M, the director of a company specializing in trading sua wood products, who asked to be anonymous, affirmed that VND24.5 billion is ‘acceptable’, and that there is no need to worry about a loss. M said the 200 year old red sua tree, one of the most valuable varieties, has a straight trunk and many branches. “The images about the sua tree exploitation showed that the outer shell is thin, while the core is very large, which means that nearly all parts of the tree can be useful,” he explained. “The trunk is straight, large in diameter, so it is easy to prepare wood to make large wooden items that cannot be made with other trees,” he said. It is expected that the wooden items to be made from the sua tree will be very expensive. M said if Huy can find buyers who understand the value of the sua tree, he will be able to make a profit. M said he personally dared not to dream of having such great and old sua trees. He has bought a lot of trees in his life, but he only could afford small sua trees, 30-40 years old, priced at VND1-2 billion.